While almost all shirt collars fasten with one button, the rare shirt collar has two stacked buttons. A collar with a very high stand needs a second button to keep the collar standing up firmly and to maintain the collar’s shape. A man with a long neck can benefit from a high, two-button collar to downplay a long neck and to better frame the face, though men with a short neck should avoid high collars. James Bond has very rarely worn two-button collars. 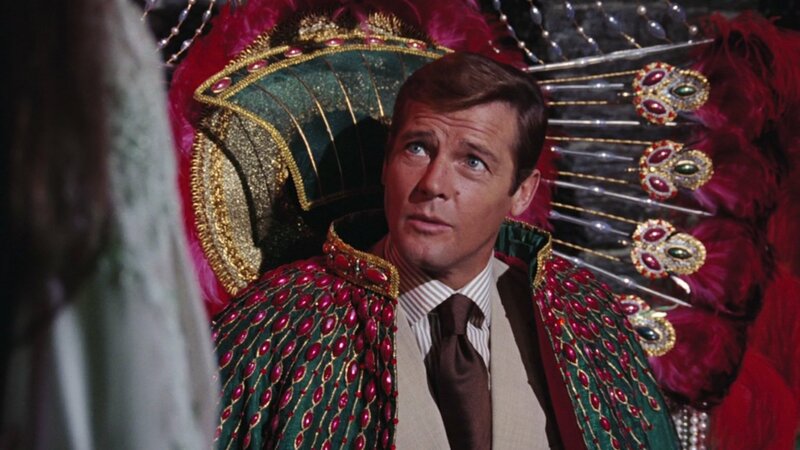 The first time that James Bond wears one is on his brown striped shirt with his beige suit in Live and Let Die. 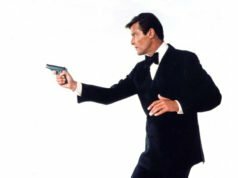 It is one of very few of Moore’s Bond shirts that was not made by Bond-series shirtmaker Frank Foster. This shirt collar sits up higher on Moore’s neck than any of his other collars do. While most of his collars come up to the bottom of his Adam’s apple, this collar is high enough to encroach on his Adam’s apple, which may have made it slightly uncomfortable. The two-button spread collar is very flattering on Moore, and it works well on him both with and without a tie. He mostly wears this shirt without a tie. 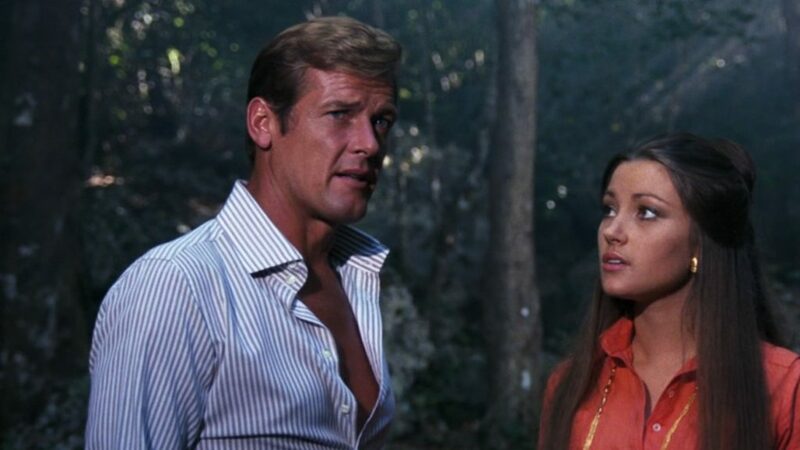 Despite this shirt collar being higher in front than the rest of Moore’s shirt collars in Live and Let Die, the two-button collar’s points are slightly shorter than the points of his one-button collars. A two-button collar only necessitates that the front of the collar band is a certain minimum height, typically over 4 cm high because that is about the tallest a collar band can be stable with only one button. The back of the collar band needs to be at least as high as the front, and the collar points need to be long enough to reach the chest. But on men who have a small face, points are better shorter than longer. 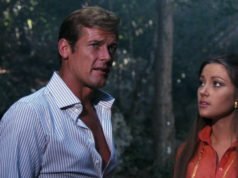 Even though Roger Moore’s collar sits very high, this collar does not look exceptionally large because the points are a not much longer than typical collar points and have a length of about 8 1/2 cm. The buttons on Roger Moore’s two-button spread collar are offset from each other to better lock the collar in place. While typical one-button collars can have a small bit of give, the locking mechanism of having an additional button means that the two-button collar can feel sturdier but more restricting. Sometimes the top button may be smaller than the bottom. At the time Casino Royale was made in 2006, two-button spread collars were very trendy, particularly for club wear. They were typically worn open without a tie, where the extra button could be shown off to signify that the shirt was something different from the ordinary business shirt. Such shirts were often worn untucked at night. Daniel Craig wears a light blue shirt with a two-button spread collar during Casino Royale‘s black-and-white pre-title sequence with a blue linen suit, properly tucked into his suit trousers. Daniel Craig usually looks better in a shorter collar when wearing a tie because his neck is not particularly long, but with the collar open he is able to wear a higher collar. Before he was James Bond, Daniel Craig wore white and sky blue shirts with two-button collars in his 2004 film Layer Cake. This collar was especially fashionable in England in the mid 2000s and was an appropriate choice for Daniel Craig’s fashionable gangster in the film. Even though the high collar slightly overwhelms Daniel Craig’s neck and head, it lends him a regal look. [Tomorrow Never Dies‘ costume designer] Lindy Hemming walked in and she said, ‘what collar do you have on?’, and I said, ‘it’s mine’. It was a two-button, up-and-down vertical, high-banded collar. She said, ‘I want that collar for Pierce’s next Bond.’ And that’s what he was wearing until he got those Brioni [shirts]. They converted it to a one-button collar. I found it too uncomfortable, so I changed it, but he was wearing it. As we approach 2020, the high two-button collar has fallen out of fashion while low collars with short points are most popular. More men, however, would benefit more from a higher collar than a shorter one. Without a tie, higher collars look better under a jacket than short collars because they are less likely to collapse under the jacket’s lapels. This is not a collar for all men, and in some circumstances it can look too flashy, but it is a collar to consider. Brosnan’s collar really does look great in Tomorrow Never Dies. I have a lot of similar proportions to Pierce, I guess it’s the Irish in me. I’m slim with a fairly long neck so his built up shoulders and taller collars look good on me. I can thank James Bond for my style. The shorter collars of today’s era make me look gangly and unweildly. The extra support from the shirt really strengthen the look. Incidentally I’ve found it frustrating when people have asked my advice to look better, but completely disregard things like this because it’s “unfashionable”. I know the feeling all too well, Timothy. I’ve had friends go steps further even than that, Jovan! I had a shirt made which someone really liked and wanted one just like it for her husband to wear to an event, so I sized him up and got it made for him too, with some small changes to collar height and shape to better suit him. I even paid for it, and gave it as a gift. I delivered the shirt, made sure it fit and lo and behold he never wore it again. He instead turned up to the party wearing a shirt far too small and looked like he was about to hulk out of the buttons. Of course, I don’t want to give the idea I’m some snob who demands appreciation out of some delusion that I know better than everyone else! I’m really not like that at all, I was just baffled that they asked for something very specific and then decided they didn’t like it. That’s aggravating, but not uncommon in retail as well. I worked for a menswear store for two years and I’d literally get people asking to look like Daniel Craig’s James Bond in a dinner suit. Then they didn’t want shawl or peak lapels. Or a single button. Or a turndown collar. So pretty much, they didn’t want to look like James Bond at all. Most of them did at least see the wisdom of getting a pleated front (we didn’t sell marcella fronted shirts, being American) and a bow tie at least, but the overall effect was not as good as it could have been. That would have been a very sad timeline! I was able to get my bespoke shirts at T&A with the brosnan collar awhile back… my first shirt had the two-button fastening which was absolutely brutal (felt like the TWINE neck crank trying to unbutton the thing). I always liked how Brosnan was able to get his tie knot to jut out at the collar… this now seems much easier to do now with a high collar and a left four in hand knot. I always thought it had to do with the tie or the fabric but the height of the collar is apparently important for this too. Would such a collar work on a shirt for black tie? I’m 6ft 6″, so I definetely have a long enough neck, and I’m looking to get a custom cream evening shirt from deo veritas. Just wondering whether it may work for my long neck with a bow tie. I think that a two-button collar made be too high for a bow tie. As much as I don’t like wing collars for black tie, a wing collar is the best way to have a tall collar for a bow tie. But you could do what Roger Moore did and wear a one-button collar that is low in the front but high in the back. Did you get the brosnan collar from TWINE or TND? I called Turnbull and Asser and they basically told me to hiss off, but it was a courteous “Hiss off” nonetheless. If you are ever in Los Angeles, the drinks, the laughs and a smoke from my reserve selection Are on me! Was the black shirt worn in his hotel room in Sardinia in The Spy Who Loved Me a 2 button collar also? It’s a very Italian look and indeed I can recall seeing very little else when I visited Italy in the 1990s! Yes, that one does as well! I haven’t spoken to Robert in awhile, but I’m wondering if he might be misremembering the timeline of his collaboration with Lindy. Either that or he was involved in providing multiple collar designs for the Bond films including both TND and TWINE. When he and I spoke about incorporating the “Brosnan” collar into my pattern, it was definitely the one featured in TWINE. The TND collar has a narrower spread anyways and looks a little different. I hope we can get some clarification. Perhaps I may have misunderstood him. Your collar looks superb and just like the The World Is Not Enough collar but with a higher band. do you want to sell one of your shirts with the TWINE collar on it? if you do, a 15 year journey will come to an end. saul – did you attempt to contact the NY or UK T&A branch? 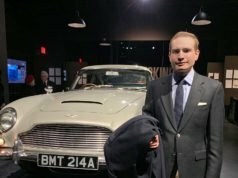 In one of the recent Bond Experience videos Blair comes pretty close to getting the collar on his own bespoke order, though was dissuaded by Liam Devaney at the last second. So I think they are willing to do it if you talk to the right people… (whether in the UK or NY). I do have a sample/trial shirt with double cuffs in the Casino Royale tux fabric with the TWINE collar (but with the 2 button closure) … not sure it would be wearable for you unless we have the same build (I’m 6’1 and a bit leaner than Bros in GE). I did attempt to contact them. LA shut down and as for new York they always try to discourage me from purchasing the shirt. Tredstone, your chevron TWINE tie (and your shirt too, obviously) looks amazing. Did you purchase it from T&A, or Magnoli Clothiers maybe ? Thanks! The tie is actually a T&A black herringbone. I (along with a few others) got it over a decade ago…this was in the dark ages of Bond collecting when we were looking at DVD stills and not realizing it was actually navy and brown. I really wanted the Magnoli version to look good but it just seems way too burnt orange from the pics. Guess I’ll have to wait till T&A officially releases the Bilbao tie (which they are apparently planning to do). Do you know when exactly , they are planning to release the TA BILBAO NECKTIE ? The project has only just begun. There are no release dates yet as they have not begun work on recreating the ties yet. They are working on sourcing the original ties so they can make exact replicas, as anything short of a perfect replica will be unacceptable. They are unable to replicate ties until they have the origins at hand to examine. I have a couple of Italian 2 button collar Dress shirts. I really really did try to like them , but just not for me. Having two collar buttons is downright brutal and uncomfortable for me , especially when wearing a tie. two collar buttons shirts are fantastic open, without a tie. I love wear these shirts in summer,are more…stately. 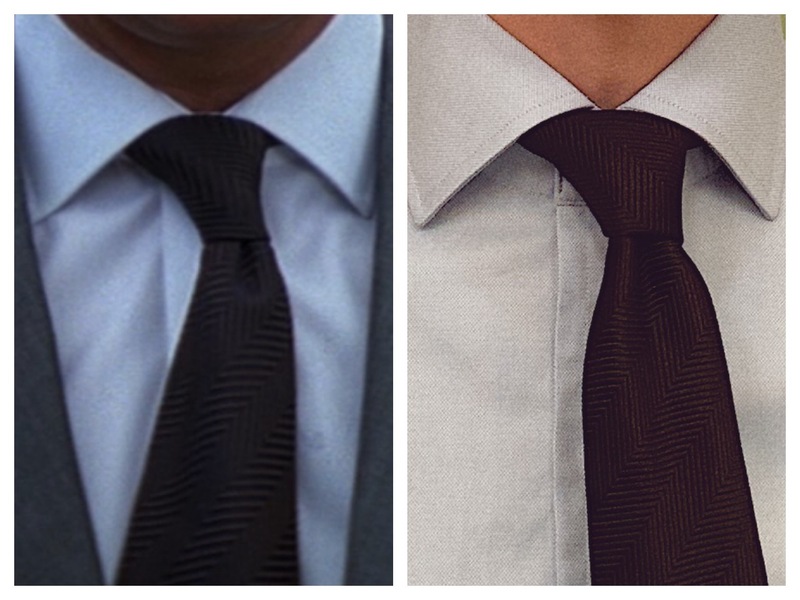 You mentioned “Neckties.” Are they planning on recreating other neckties in the bond series? Yes, they are looking into replicating many Brosnan ties. The biggest problem is that they have none of the originals. Well this is exciting! 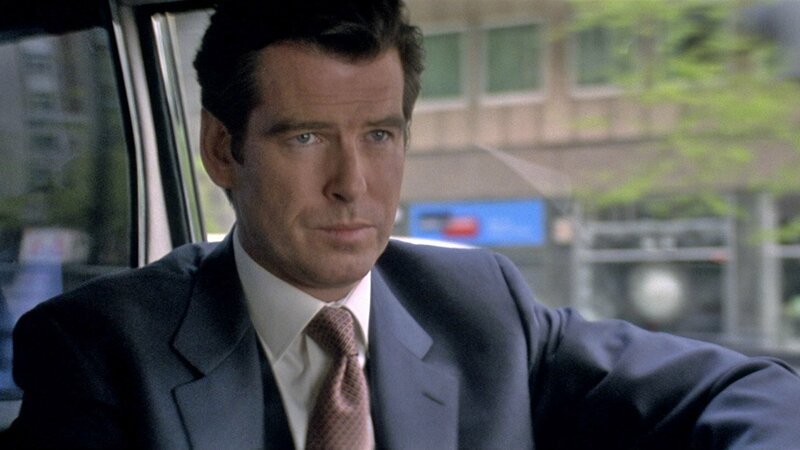 The day I get my hands on the ruby tie from Die Another Day I will be very happy. I own one Turnbull and Asser tie, it happens to be the same as the copper and blue one that Bond wears at the start of Tomorrow Never Dies but in red and blue instead. The difference in quality between that and my cheaper ties is night and day. I’d be stoked to get more. Timothy – as mentioned above Magnoli’s ties vary in accuracy but the rubeyon tie which he replicated is pretty widely regarded as spot-on and well done to the original. I’d recommend getting that one if you don’t want to wait around 2-3 years to see whether T&A ultimately decides to recreate their own version. I have not seen the Magnoli tie in person, but from the photos online I am very impressed. I actually have the Magnoli version, and it is one of my favourite ties. But having now handled both a Magnoli replica and an original Turnbull and Asser on which it’s based (the aforementioned TND tie) I still really want the real deal. Don’t get me wrong, Magnoli does great ties, and I have a few of his Doctor Who ones too, but if I have the opportunity down the road to purchase and support the original makers then all the better! I wish they would be available in a slimmer width though. The 9.5 cm tie doesn’t go well with a small suit size like 38. 8.5 would be perfect. As to why turnbull asser didn’t do this before I will never know. Not a prudent business decision. Here’s what I think is going on with Brosnan’s collars (see pic). On his paper pattern you can see 4 collar names printed – “TA”, “REG”, “NO3”, and “POW”. I think it’s safe to say these refer to the standard T&A collar, Regent, Number 3 (which T&A actually has a collar named this), and Prince of Wales. It seems clear some of these are NOT stock but rather modified versions of T&A’s collar offerings to suit Pierce’s, which would be consistent with what I learned from Robert (e.g., the TWINE collar being a modified version of the Regent). I color-coded what I think corresponds with each collar. The shape of the “regent” collar (the one I marked in green) is the same shape when laid out as the TWINE collar I have. The standard T&A collar must be for Pierce’s own shirts and aren’t seen on screen. I’m guessing the TND collar is likely either a modified POW or No3 seen in this pattern? I’m having a hard time eyeballing that. I’d also be curious where the Thomas Crown shirt collars fit into this. Sorry if this is way beyond anyone’s interest level lol. I appreciate Lindy Hemming’s efforts to make minor iterations to find a balanced and proportional look with each film, as opposed to the inconsistency and often arbitrary changes seen in the Craig era. Excellent work! I think the TND collar was based on the Prince of Wales collar; the No3 is too narrow. The Thomas Crown collar looks the same. Where is that collar design photo from? I know I’ve seen it before. Thanks! It’s a screenshot from Blair’s trip to T&A from the Bond Experience video. I flipped it upside down so it’s easier to analyze. 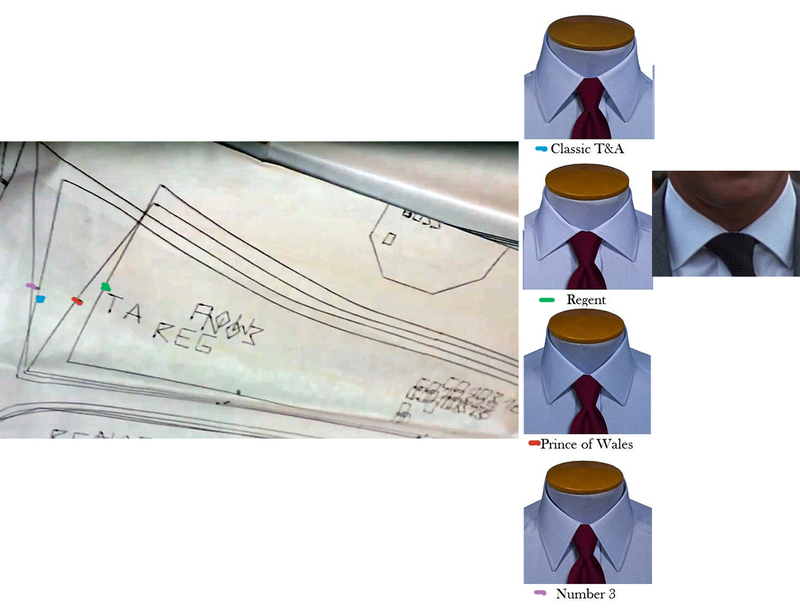 Your picture of Brosnan’s pattern from your trip to Bury Street also shows some of the collars, although the overlapping outlines helps provide a little context to how they look in relation to one another.